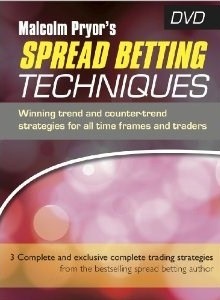 The DVD is called Malcolm Pryor's Spread Betting Techniques, with a subsidiary title "Winning trend and counter-trend strategies for all time frames and traders". Here is an extract from the marketing description on the back of the DVD. A two-hour DVD with accompanying workbook, this is the most comprehensive one-on-one spread betting training course available. Pryor unveils the details of three strategies, both trend-following and counter-trend, with a blend of in-chart demonstration and to-camera presentation. Featuring more than 20 video modules, including - alongside the detailed explanation of the three strategies - a refresher on key trading concepts, plus advanced insights on adapting and constructing your own strategies. Purchase of the DVD also includes support via the members’ area of the Spreadbetting Central forum. Access to the members’ area is limited to seminar attendees and purchasers of the DVDs.